Not to be confused with Balto-Finnic languages or Balti language. The Baltic languages belong to the Balto-Slavic branch of the Indo-European language family. Baltic languages are spoken by the Balts, mainly in areas extending east and southeast of the Baltic Sea in Northern Europe. Scholars usually regard them as a single language family divided into two groups: Western Baltic (containing only extinct languages) and Eastern Baltic (containing two living languages, Lithuanian and Latvian). The range of the Eastern Baltic linguistic influence once possibly reached as far as the Ural Mountains, but this hypothesis has been questioned. Old Prussian, a Western Baltic language that became extinct in the 18th century, ranks as the most archaic of the Baltic languages. Although morphologically related, the Lithuanian, Latvian and, particularly, Old Prussian vocabularies differ substantially from one another, and as such they are not mutually intelligible, mainly due to a substantial number of false friends, and foreign words, borrowed from surrounding language families, which are used differently. The Baltic languages are generally thought to form a single family with two branches, Eastern and Western. However, these two branches are sometimes classified as independent branches of Balto-Slavic. It is believed that the Baltic languages are among the most archaic of the currently remaining Indo-European languages, despite their late attestation. 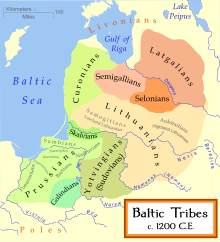 Although the various Baltic tribes were mentioned by ancient historians as early as 98 B.C., the first attestation of a Baltic language was about 1350, with the creation of the Elbing Prussian Vocabulary, a German to Prussian translation dictionary. Lithuanian was first attested in a hymnal translation in 1545; the first printed book in Lithuanian, a Catechism by Martynas Mažvydas was published in 1547 in Königsberg, Prussia (now Kaliningrad, Russia). Latvian appeared in a hymnal in 1530 and in a printed Catechism in 1585. One reason for the late attestation is that the Baltic peoples resisted Christianization longer than any other Europeans, which delayed the introduction of writing and isolated their languages from outside influence. With the establishment of a German state in Prussia, and the eradication or flight of much of the Baltic Prussian population in the 13th century, the remaining Prussians began to be assimilated, and by the end of the 17th century, the Prussian language had become extinct. During the years of the Polish–Lithuanian Commonwealth (1569–1795), official documents were written in Polish, Ruthenian and Latin. After the Partitions of Commonwealth, most of the Baltic lands were under the rule of the Russian Empire, where the native languages or alphabets were sometimes prohibited from being written down or used publicly in a Russification effort (see Lithuanian press ban for the ban in force from 1865 to 1904). Speakers of modern Baltic languages are generally concentrated within the borders of Lithuania and Latvia, and in emigrant communities in the United States, Canada, Australia and the countries within the former borders of the Soviet Union. Historically the languages were spoken over a larger area: west to the mouth of the Vistula river in present-day Poland, at least as far east as the Dniepr river in present-day Belarus, perhaps even to Moscow, and perhaps as far south as Kiev. Key evidence of Baltic language presence in these regions is found in hydronyms (names of bodies of water) that are characteristically Baltic. The use of hydronyms is generally accepted to determine the extent of a culture's influence, but not the date of such influence. The Mordvinic languages, spoken mainly along western tributaries of the Volga, show several dozen loanwords from one or more Baltic languages. These may have been mediated by contacts with the Eastern Balts along the river Oka. The eventual expansion of the use of Slavic languages in the south and east, and Germanic languages in the west, reduced the geographic distribution of Baltic languages to a fraction of the area that they formerly covered. The Russian geneticist Oleg Balanovsky speculated that there is a predominance of the assimilated pre-Slavic substrate in the genetics of East and West Slavic populations, according to him the common genetic structure which contrasts East Slavs and Balts from other populations may suggest that the pre-Slavic substrate of the East Slavs consists most significantly of Baltic-speakers, which predated the Slavs in the cultures of the Eurasian steppe according to archaeological references he cites. Though Estonia is included among the Baltic states due to its location, Estonian is a Uralic language and is not related to the Baltic languages, which are Indo-European. The Baltic languages are of particular interest to linguists because they retain many archaic features, which are believed to have been present in the early stages of the Proto-Indo-European language. However, linguists have had a hard time establishing the precise relationship of the Baltic languages to other languages in the Indo-European family. Several of the extinct Baltic languages have a limited or nonexistent written record, their existence being known only from the records of ancient historians and personal or place names. All of the languages in the Baltic group (including the living ones) were first written down relatively late in their probable existence as distinct languages. These two factors combined with others have obscured the history of the Baltic languages, leading to a number of theories regarding their position in the Indo-European family. The Baltic languages show a close relationship with the Slavic languages, and are grouped with them in a Balto-Slavic family by most scholars. This family is considered to have developed from a common ancestor, Proto-Balto-Slavic. Later on, several lexical, phonological and morphological dialectisms developed, separating the various Balto-Slavic languages from each other. Although it is generally agreed that the Slavic languages developed from a single more-or-less unified dialect (Proto-Slavic) that split off from common Balto-Slavic, there is more disagreement about the relationship between the Baltic languages. 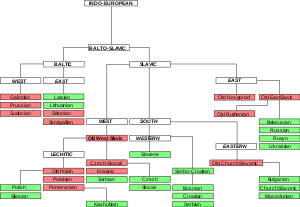 The traditional view is that the Balto-Slavic languages split into two branches, Baltic and Slavic, with each branch developing as a single common language (Proto-Baltic and Proto-Slavic) for some time afterwards. Proto-Baltic is then thought to have split into East Baltic and West Baltic branches. However, more recent scholarship has suggested that there was no unified Proto-Baltic stage, but that Proto-Balto-Slavic split directly into three groups: Slavic, East Baltic and West Baltic. Under this view, the Baltic family is paraphyletic, and consists of all Balto-Slavic languages that are not Slavic. This would imply that Proto-Baltic, the last common ancestor of all Baltic languages, would be identical to Proto-Balto-Slavic itself, rather than distinct from it. In the 1960s Vladimir Toporov and Vyacheslav Ivanov made the following conclusions about the relationship between the Baltic and Slavic languages: a) Proto-Slavic language formed from the peripheral-type Baltic dialects; b) Slavic linguistic type formed later from the Baltic languages structural model; c) the Slavic structural model is a result of the Baltic languages structural model transformation. These scholars’ theses do not contradict the Baltic and Slavic languages closeness and from a historical perspective specify the Baltic-Slavic languages evolution. Finally, there is a minority of scholars who argue that Baltic descended directly from Proto-Indo-European, without an intermediate common Balto-Slavic stage. They argue that the many similarities and shared innovations between Baltic and Slavic are due to several millennia of contact between the groups, rather than shared heritage. The Baltic classification of Dacian and Thracian has been proposed by the Lithuanian scientist Jonas Basanavičius, who insisted this is the most important work of his life and listed 600 identical words of Balts and Thracians. His theory included Phrygian in the related group, but this did not find support and was disapproved among other authors, such as Ivan Duridanov, whose own analysis found Phrygian completely lacking parallels in either Thracian or Baltic languages. The Bulgarian linguist Ivan Duridanov, who improved the most extensive list of toponyms, in his first publication claimed that Thracian is genetically linked to the Baltic languages and in the next one he made the following classification:"The Thracian language formed a close group with the Baltic (resp. Balto-Slavic), the Dacian and the "Pelasgian" languages. More distant were its relations with the other Indo-European languages, and especially with Greek, the Italic and Celtic languages, which exhibit only isolated phonetic similarities with Thracian; the Tokharian and the Hittite were also distant. " Of about 200 reconstructed Thracian words by Duridanov most cognates (138) appear in the Baltic languages, mostly in Lithuanian, followed by Germanic (61), Indo-Aryan (41), Greek (36), Bulgarian (23), Latin (10) and Albanian (8). The cognates of the reconstructed Dacian words in his publication are found mostly in the Baltic languages, followed by Albanian. Parallels have enabled linguists, using the techniques of comparative linguistics, to decipher the meanings of several Dacian and Thracian placenames with, they claim, a high degree of probability. Of 74 Dacian placenames attested in primary sources and considered by Duridanov, a total of 62 have Baltic cognates, most of which were rated "certain" by Duridanov. For a big number of 300 Thracian geographic names most parallels were found between Thracian and Baltic geographic names in the study of Duridanov. According to him the most important impression make the geographic cognates of Baltic and Thracian "the similarity of these parallels stretching frequently on the main element and the suffix simultaneously, which makes a strong impression". ^ Hammarström, Harald; Forkel, Robert; Haspelmath, Martin, eds. (2017). "Eastern Baltic". Glottolog 3.0. Jena, Germany: Max Planck Institute for the Science of Human History. ^ a b Hammarström, Harald; Forkel, Robert; Haspelmath, Martin, eds. (2017). "Old Prussian". Glottolog 3.0. Jena, Germany: Max Planck Institute for the Science of Human History. ^ Marija Gimbutas 1963. The Balts. London : Thames and Hudson, Ancient peoples and places 33. ^ Ringe, D., Warnow, T., Taylor, A., 2002. Indo-European and computational cladistics. Trans. Philos. Soc. 100, 59–129. ^ Dini, P.U. (2000). Baltų kalbos. Lyginamoji istorija. Vilnius: Mokslo ir enciklopedijų leidybos institutas. p. 61. ISBN 5-420-01444-0. ^ Grünthal, Riho (2012). "Baltic loanwords in Mordvin" (PDF). A Linguistic Map of Prehistoric Northern Europe. Suomalais-Ugrilaisen Seuran Toimituksia 266. pp. 297–343. ^ П, Балановский О. "Генофонд Европы" (in Russian). KMK Scientific Press. Прежде всего, это преобладание в славянских популяциях дославянского субстрата — двух ассимилированных ими генетических компонентов – восточноевропейского для западных и восточных славян и южноевропейского для южных славян...Можно с осторожностью предположить, что ассимилированный субстратмог быть представлен по преимуществу балтоязычными популяциями. Действительно, археологические данные указыва ют на очень широкое распространение балтских групп перед началом расселения славян. Балтскийсубстрату славян (правда, наряду с финно-угорским) выявляли и антропологи. Полученные нами генетические данные — и на графиках генетических взаимоотношений, и по доле общих фрагментов генома — указывают, что современные балтские народы являются ближайшими генетически ми соседями восточных славян. При этом балты являются и лингвистически ближайшими род ственниками славян. И можно полагать, что к моменту ассимиляции их генофонд не так сильно отличался от генофонда начавших свое широкое расселение славян. Поэтому если предположить,что расселяющиеся на восток славяне ассимилировали по преимуществу балтов, это может объяснить и сходство современных славянских и балтских народов друг с другом, и их отличия от окружающих их не балто-славянских групп Европы...В работе высказывается осторожное предположение, что ассимилированный субстрат мог быть представлен по преимуществу балтоязычными популяциями. Действительно, археологические данные указывают на очень широкое распространение балтских групп перед началом расселения славян. Балтский субстрат у славян (правда, наряду с финно-угорским) выявляли и антропологи. Полученные в этой работе генетические данные — и на графиках генетических взаимоотношений, и по доле общих фрагментов генома — указывают, что современные балтские народы являются ближайшими генетическими соседями восточных славян. ^ Marija Gimbutas (1963). The balts, by marija gimbutas. Thames and hudson. Retrieved 3 December 2011. ^ Ancient Indo-European Dialects. University of California Press. pp. 139–151. GGKEY:JUG4225Y4H2. Retrieved 3 December 2011. ^ J. P. Mallory (1 April 1991). In search of the Indo-Europeans: language, archaeology and myth. Thames and Hudson. ISBN 978-0-500-27616-7. Retrieved 3 December 2011. ^ J. P. Mallory (1997). Encyclopedia of Indo-European culture. Taylor & Francis. p. 46. ISBN 978-1-884964-98-5. Retrieved 3 December 2011. ^ Derksen, Rick (2008), Etymological Dictionary of the Slavic Inherited Lexicon, p. 20, I am not convinced that it is justified to reconstruct a Proto-Baltic stage. The term Proto-Baltic is used for convenience’s sake. ^ Hans Henrich Hock; Brian D. Joseph (1996). Language history, language change, and language relationship: an introduction to historical and comparative linguistics. Walter de Gruyter. p. 53. ISBN 978-3-11-014784-1. Retrieved 24 December 2011. ^ a b Mayer 1996. ^ a b c d Duridanov 1969. ^ a b JŪRATĖ STATKUTĖ DE ROSALES EUROPOS ŠAKNYS IR MES, LIETUVIAI, pp. 43-70 (PDF). ^ Balts and Goths: the missing link in European history. Vydūnas Youth Fund. ^ Daskalov, Roumen; Vezenkov, Alexander. Entangled Histories of the Balkans – Volume Three: Shared Pasts, Disputed Legacies. BRILL. ISBN 9789004290365. ^ a b c d Duridanov 1976. ^ Duridanov 1969, pp. 95-96. ^ a b Duridanov 1985. "Lithuania 1863-1893: Tsarist Russification and the Beginnings of the Modern Lithuanian National Movement - Strazas". www.lituanus.org. Retrieved 5 October 2017. Mayer, H.E. (1992). "Dacian and Thracian as southern Baltoidic". Lituanus. Defense Language Institute, United States Department of Defense. 38 (2). ISSN 0024-5089. Mayer, H.E. (1996). "SOUTH BALTIC". Lituanus. 42 (2). Mayer, H.E. (1997). "BALTS AND CARPATHIANS". Lituanus. 43 (2). Duridanov, I. (1969). Die Thrakisch- und Dakisch-Baltischen Sprachbeziehungen. Duridanov, I. (1976). Ezikyt na Trakite. Duridanov, I. (1985). Die Sprache der Thraker. Mayer, H.E. (1999). "Dr. Harvey E. Mayer, February 1999".